1دانشجوی دکتری، گروه مهندسی عمران، دانشکده فنی، دانشگاه تهران، تهران، ایران. 2کارشناسی ارشد، گروه مهندسی عمران، دانشکده فنی، دانشگاه تهران، تهران، ایران. 4استاد، گروه مهندسی عمران، دانشکده فنی، دانشگاه تهران، تهران، ایران. 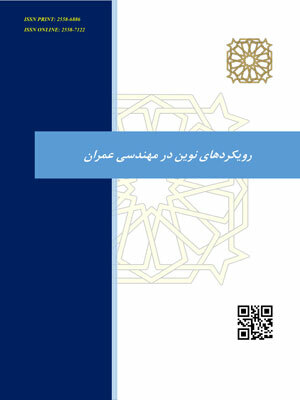 درسالهای اخیر، یک نوع بتن مسلح جدید با نام بتن مسلح ترکیبی ساخته شده است که ترکیبی از الیاف با مصالح یکسان ولی شکل هندسی متفاوت است. هدف از تحقیق حاضر، ارزیابی تاثیر نسبت ابعاد و حجم تقریبی الیاف فولادی بر روی خصوصیات مکانیکی و بنیادی بتن مسلح الیاف فولادی ترکیبی می­باشد. برای نیل به این هدف، الیاف مسلح کننده بتن از ترکیبات مختلف حجم تقریبی الیاف و شکل و اندازه متفاوت تشکیل شدند و مورد آزمایش قرار گرفتند. نتایج بدست آمده از مطالعات از نظر مقاومت فشاری، مقاومت کششی و سختی خمشی براساس آزمایش خمش چهار نقطه­ای مورد مقایسه واقع شدند. نتایج بدست آمده از تحقیق حاضر نشان داده است که در حالت کلی اندازه های کوچک و بزرگ الیاف فولادی تاثیر مناسب بر روی خصوصیات مهندسی بتن دارد. همچنین، روابط مناسب جهت ارتباط بین خصوصیات مکانیکی مهم بتن مسلح ترکیبی و با حجم تقریبی الیاف با اندازه های کوچک و بزرگ ارائه شده است. - De la Fuente, A., Pablo, P., Ana, B. and Antonio, A. (2012). Experiences in Barcelona with the use of fibres in segmental linings, Tunnelling and Underground Space Technology, 27: 60-71. - di Carlo, F., Meda, A., Rinaldi, Z. (2016). Design procedure for precast fibre-reinforced concrete segments in tunnel lining construction, Structural Concrete, 17: 747-59. - Meng, G., Bo, G., Jiamei, Z., Guodong, C. and Qian, Z. (2016). Experimental investigation of the mechanical behavior of the steel fiber reinforced concrete tunnel segment, Construction and Building Materials, 126: 98-107. - Caggiano, A., Paula, F., Carmine, L., Enzo, M. and Marco, P. (2017). On the mechanical response of Hybrid Fiber Reinforced Concrete with Recycled and Industrial Steel Fibers, Construction and Building Materials, 147: 286-95. - Li, J., Chengqing, W. and Zhong-Xian, L. (2017). Comparative evaluation of steel wire mesh, steel fibre and high performance polyethylene fibre reinforced concrete slabs in blast tests, Thin-Walled Structures. - Nehdi, M. L., Manal, F. N., Ahmed, M. S. and Tareq, M. A. (2017). Novel steel fiber reinforced preplaced aggregate concrete with superior mechanical performance, Cement and Concrete Composites, 82: 242-51. - Sorelli, L. G., Alberto, M. and Plizzari, G. A. (2005). Bending and uniaxial tensile tests on concrete reinforced with hybrid steel fibers, Journal of materials in civil engineering, 17: 519-27. - Su, Y., Jun, L., Chengqing, W., Pengtao, W., Ming, T. and Xibing, L. (2017). Mesoscale study of steel fibre-reinforced ultra-high performance concrete under static and dynamic loads, Materials & Design, 116: 340-51. - Ganesan, N., Sahana, R. and Indira, P. V. (2017). Effect of hybrid fibers on tension stiffening of reinforced geopolymer concrete, Advances in Concrete Construction, An Int'l Journal, 5. -Banthia, N., Yan, C. and Bindiganavile, V. (2000). Development and application of high performance hybrid fiber reinforced concrete, In Proceedings of the fifth international RILEM symposium on fibre-reinforced concrete, 471-80. Lyon, France. - Ganesan, N., Indira, P.V. and Irshad, P. (2017). RCC frames with Ferro cement and fiber reinforced concrete infill panels under reverse cyclic loading, Advances in Concrete Construction, An International Journal, 5. - Mobasher, B., and Li, C.Y. (1996). Mechanical properties of hybrid cement-based composites, ACI Materials Journal, 93. - Mobasher, B. (2011). Mechanics of fiber and textile reinforced cement composites (CRC press). - Libre, N., Shekarchi, A. M., Mahoutian, M., and Soroushian, P. (2011). Mechanical properties of hybrid fiber reinforced lightweight aggregate concrete made with natural pumice, Construction and Building Materials, 25: 2458-64. - Alberti, M. G., Enfedaque, A., and Gálvez, J. C. (2017). Fibre reinforced concrete with a combination of polyolefin and steel-hooked fibres, Composite Structures, 171: 317-25. -Banthia, N., Nandakumar, N. (2003). Crack growth resistance of hybrid fiber reinforced cement composites, Cement and Concrete Composites, 25: 3-9. - Plizzari, G. A. and Tiberti, G. (2006). Steel fibers as reinforcement for precast tunnel segments', Tunnelling and Underground Space Technology incorporating Trenchless Technology Research, 3: 438-39. - Japan Concrete Inst. (1984). JSCE-SF4. Standard for flexural strength and flexural toughness, method of tests for steel fiber reinforced concrete, In Concrete library of JSCE, 58-66. - ASTM. (1993). Annual book of ASTM standards, section 6, vol. 4.02, concrete and aggregates, In. Philadelphia, USA: American Society for Testing and Materials.